Plastic seams to be the route that many of the larger miniature makers are taking. With the rising and ever changing cost of metals, it's no surprise that now Privateer Press is also testing the waters with some new plastic miniatures. The first ones to be released are Heavy Warjack kits for each faction. 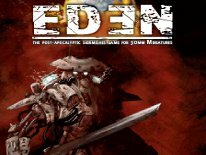 They offer Cryx, Cygnar, Khador, Menoth and Retribution of Scyrah kits. 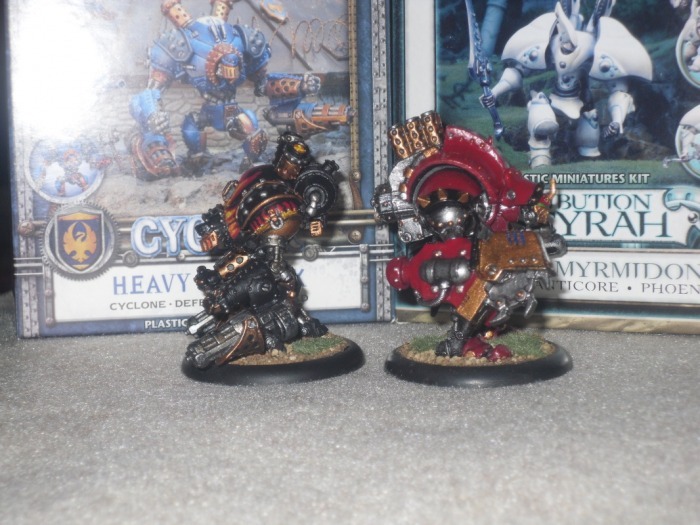 One of the neatest features is that you can choose which figure to make, from a selection of three different builds, while the Khador kit makes one of four different heavy warjacks. Yes I'm aware that the Retribution of Scyrah calls their heavy warjacks Myrmidons, and Cryx call theirs Helljacks, but for simplicity sake, I'll stick with calling them all Warjacks. I've purchased and own four of these kits. My first kit was the Khador one. It allowed for building a Juggernaut, Destroyer, Marauder or the new Decimator. I opted to build the newest one (Decimator), which can only be made from this kit. The other three are new plastic versions of the older metal counterparts. The second kit I picked up is the Cygnar one. It allowed for building of the IronClad, Defender and the new exclusive to this box sculpt is the Cyclone. I opted to build the Cyclone. The third and fourth kits I picked up are two of the Retribution of Scyrah Myrmidons. Each kit can make a Hydra, Manticore or Phoenix. I ran with making a Phoenix and Manticore for my new Retribution army that I am building. Lets talk plastic. Evidently all plastic isn't created equal. 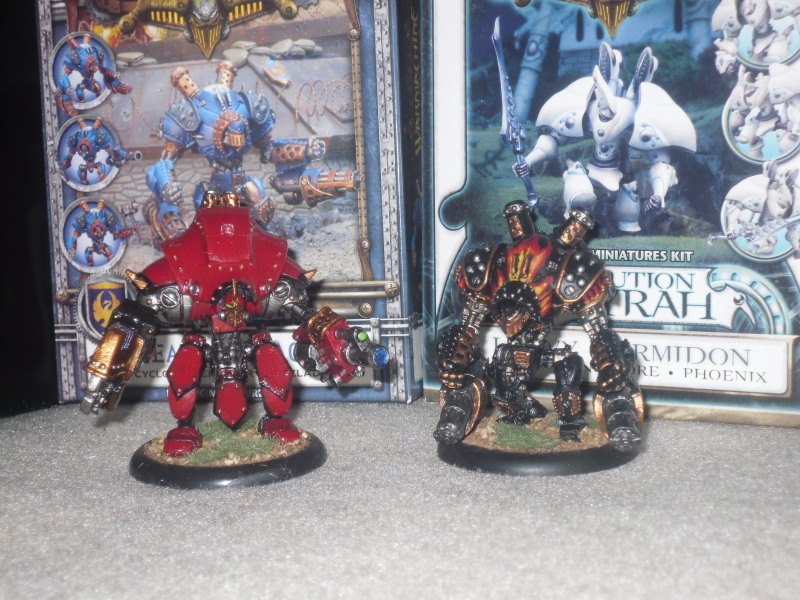 My first kit was the Khador one. The plastic seamed ok, almost like a cross between GamesWorkshops' plastic, and resin kits I've owned in the past. It's hard and very light in color. In terms of flash and mold lines, I was disappointed. While most of the basic mold lines are expected, and could be easily cleaned up... the Khador kit had a really nasty line that reached around the back of the boiler part of the kit, from front, all the way around the back. It was in a spot that just didn't make sense, and made for extremely tough removal. There are just some spots, once in a while, that you can't easily get a hobby knife or file in to get at something with. This was definitely one of those moments. That aside, the kit itself is nice, and goes together very well, and I enjoy my Decimator piece a lot now. However, I was cussing like a sailor trying to clean it up. The next kit I assembled was the Cygnar one. Again, it may have had a few more mold lines than I preferred to have to deal with, but nothing at all like the Khador kit. In all honestly, I can't say it was that much worse than a GamesWorkshop plastic kit in terms of clean up. This kit was by far my favorite of the bunch, as I really love the Cyclone model. It was the most fun to build, and now play in Warmachine. Lastly I purchased a fairly large Retribution of Scyrah army from an online retailer, and in that order I picked up two of the heavy kits. Right off the bat, these looked different. The plastic looked darker, and in terms of mold lines, I can't say it was any better, or any worse than the Cygnar one. However, there looked like a swirl, almost marbling in the plastic on the hull of the warjack. I ran my finger over it, and it didn't seam to be raised, and I used my file to make sure it was flush, and I left it at that. I figured once painted, it will be just fine no one will see it. I assembled the first kit into a Phoenix, and started on the second one. I opened the box, and again, the same thing was present. Almost an identical anomaly in the plastic. Once again, I cleaned up the entire model best I could, ran my file over that area to be certain it was flush, and left it at that. I primed the models, and let them to dry. The next morning I was going to begin painting them and noticed that anomaly ended up showing thro the primer. Evidently it's not raised, but indented! I was mad. It's so small of an indent, that by finger touch alone you couldn't feel it either. Primer took to the plastic very well too, but on these models, they seamed slicker than normal, and I ended up having a hard time getting even thin coats of paint to take at first. I can't blame the plastic for this, as it could be the primer too, but it was Armory primer, and I've never had a problem in the past with it. I guess I could have primed it a little too thin as well. Well lets talk price. The MSRP is $34.99 per heavy jack kit for any of the factions. The online discounted price on average is about $24.99, and oddly I've been seeing the Retribution of Scyrah kits for as low as $20.99-$22.99 on average. I think I know why. They really aren't the best looking models. At first when I saw Retribution of Scyrah... I thought "wow those are sooooooo ugly", and "I'll never play those". Then I played a guy using that army, and learned first-hand how good they were, and how nice the rest of the pieces, aside from the jacks looked. I was hooked. Overall the Myrmidons are the ugly ducklings of Warmachine universe without question. Every time I look at those heads on the Myrmidons, I'm reminded of Bender from Futurama. So looking at them from a price standpoint... if you plan to make the kit into any of the older existing models, it's cheaper to just buy the older metal existing models at $17-$20 each. At least while they're still available that is. Eventually once they run the stock dry of the old metal ones, these will no doubt replace those on the shelves for good. Now if you're into moding these are the best thing going. Using rare Earth magnets, one could fairly easily get three models for the price of one from one of these kits, since you end up with all of the left over arm, weapon and head bits from the models that you didn't choose to make with the kit. I was out of magnets, or I'd have done that with all four of the kits I bought. All the extra bits aside though, I'm not seeing the cost benefit of these being plastic versus metal being filtered down to our wallets. Yes the extra bits are nice, and yes it's cool that we could make three, or in the case of the Khador kit, four models for one price with magnets. However, not everyone will do that, and not everyone can do that. Most like myself will buy the kit to make the newest model that's exclusive to the kit, and end up with extra bits we paid for, but didn't want. In the end we're paying the same price, or more for the plastic kit versus a metal one of the same size too. 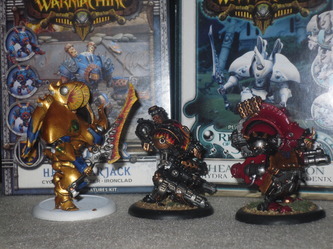 Visually speaking, some players seam to prefer the look of the new sculps of the old models, over the originals. They definitely do look different. I can't say better, that's a matter of opinion really. Factually though, they stand taller than the original metal counterparts, and look to have longer arms. They don't look bad at all, but noticeably different. I do really like the Cyclone and Decimator sculpts, and sculpt-wise for being plastic these are all amazing looking models once cleaned up and painted nicely. My only concern is that they need to iron out the quality control issues. 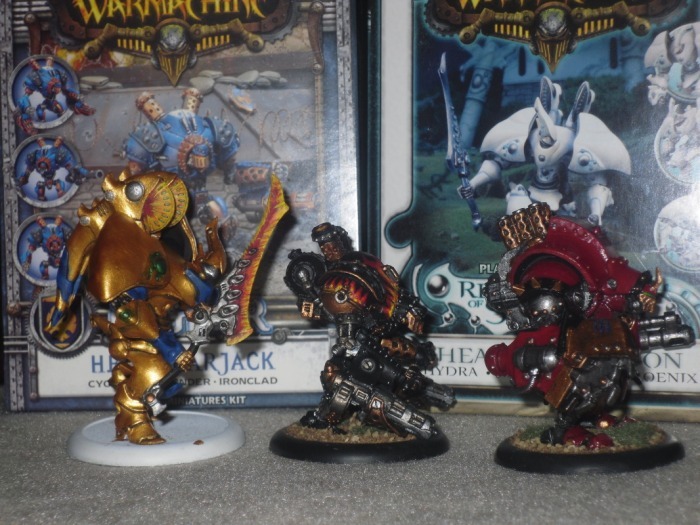 I was extremely upset with my Khador kit and the Myrmidons at first. There's definitely an issue in quality control that needs addressed. I've seen others share the same concerns, and far more who've had no issues at all. So the quality control problem I experienced seams a minority issue at the moment, but it's still an issue nonetheless. If I end up with three out of four boxes with issues, all from different retailers ...there's no denying then that there's a quality control issue. They delayed the next few releases of plastic kits a month or so back. I hope it was to get a better grasp on quality control. The next round was supposed to include Light Warjack kits and some troops. The pictures do look nice tho, and I can't wait to get a Cygnar Firefly for my army. I just hope that I end up with no issues like this next time. Overall, I like the kits for what they are, and if you end up with a good kit, then you end up with a very nice plastic heavy warjack for Warmachine, and the option to pick and choose which one to make. I still have a hard time getting used to picking one up, and feeling next to no weight to them now. You almost want to weigh down the base with some buckshot or something, so that they don't blow away. I guess Warmachine isn't as heavy metal as it once was now, but it's still the one of the very best looking games around to play!